Bangalore is believed to have been founded in 1537 by Kempe Gowda (1510 - 1570). During the time of the Puranas,this region was known as "Kalyanapuri" or "Kalyananagara",the "City Auspicious". The Mauryan Emperor,Chandragupta Maurya,renounced his throne to become a Jain Monk at Shravanabelagola,a Jain piligrimage center,southwest of Bangalore. Bengaluru was first mentioned in records from the Ganga era as a small hamlet,the location of which coincides with modern Halebengaluru near Kodigehalli (not far from Hebbal). It is said that when Kempe Gowda built his new capital town in about 1537,he called it Bengaluru as his mother and wife belonged to the hamlet of Hal� Bengaluru (Old Bangalore). The Government of Karnataka has recently renamed the city of Bangalore as Bengaluru. Just as with Chennai they hope Bangalore will soon be known the world over by its ancient name Bengaluru. Another version suggests that the name Bangalore derives from Benda kalu,which means Boiled beans. It is said that a humble old lady served a 10th century ruler,King Veeraballa of Vijayanagara who lost his way in the forest. He liked the food so much he named the place Benda Kaluru,meaning "the city of boiled beans",to commemorate his experience. After the arrival of the British,the city was given the anglicized name of "Bangalore". The reign of Bangalore changed hands several times. It was ruled by the Adil Shahisultans of Bijapur until 1638,when it was captured by the Maratha ruler Shahji Bhonsle. After 50 years of Maratha rule Bangalore was conquered by the Mughals in 1686. The city was leased to the Mysore ruler Chikkadevaraya by the Mughals around 1689 and Chikkadevaraya expanded the Bangalore fort to the south and built the Venkataramana temple in this fort area. This new fort in granite was strengthened by Haider Ali who secured Bangalore as a jahgir in 1759. The British under Lord Cornwallis conquered the place in 1799 after defeating Tipu Sultan. Telephone lines were laid to help coordinate anti-plague operations. Regulations for building new houses with proper facilities of sanitation came into effect. A health officer was appointed in 1898 and the Victoria Hospital was inaugurated in 1900 by Lord Curzon,the then Viceroy. It is also believed that the advent of railways was a causal factor for the epidemic. The plague of 1898 also led to the expansion of Bangalore. Basavanagudi (named after the Basaveshwara Temple or the Bull Temple in the Sunkenahalli village) and Malleshwaram (named after the Kadu Malleshwara Temple in the old Mallapura village) were created during this time. Kalasipalyam (near the old fort) and Gandhinagar were created between 1921-1931. Kumara Park came into existence in 1947 and Jayanagar in 1948. Bangalore is a former cantonment and Civil and Military Station after 1881 and has roads named according to military conventions such as Artillery Road,Brigade Road,CMH Road,Infantry Road and Cavalry Road. The South Parade (presently Mahatma Gandhi Road) was to the south of the Parade Ground. The cantonment area was administered by a Resident and his quarters was called the Residency and hence the Residency Road. In around 1883,three extensions were added to the Municipal area of the Cantonment,namely,Richmond Town,followed by Benson Town and Cleveland Town. Bangalore was never planned to be the boomtown metropolis it is now. Rather,it was viewed traditionally as a place of retreat,also called a 'Pensioner's Paradise'. This lack of planning has led to its current infrastructure problems. Several speculations have been made about how the name "Bangalore" came about. Based on information from the Gazetteer of India, Karnataka State, Bangalore District section, the name "Bangalore" is an anglicised version of "Bengalooru," a word in the local Kannada language that was given to a town. The story goes that this word was derived from the phrase "bende kaalu ooru," which translates into "the town of boiled beans." It is said that King Ballala of the Hoysala dynasty lost his way in the jungle while on a hunting expedition. Tired and hungry, he encountered a poor, old woman who offered him the only food she had - some boiled beans. Grateful to her, the king named the place "bende kaalu ooru." However, historical evidence shows that "Bengalooru" was recorded much before King Ballala's time in a 9th century temple inscription in the village of Begur. "Bengalooru" still exists today within the city limits in Kodigehalli area and is called "Halebengalooru" or "Old Bangalore." In 1638, Bangalore was conquered by Bijapur Sultan and ruled for next 50 years. Later it was captured by Mughals who held it for 3 years. In 1687, the Mughal Sultan of Sira province sold Bangalore to king Chikkadevaraja Wodeyar of Mysore for 3 lac pagodas, who built a second fort to the south of that built by Kempegowda I. In 1759, Hyder Ali received Bangalore as a jagir from Krishna raja Wodeyar II. He fortified the southern fort and made Bangalore an army town. When Tipu Sultan died in the 4th Mysore war in 1799, the British gave the kingdom, including Bangalore back to Krishna raja Wodeyar III. The British Resident stayed in Bangalore. In 1831, alleging misrule by Krishna raja Wodeyar III, the British took over the administration of the Mysore Kingdom. Under the British influence, Bangalore bloomed with modern facilities like the railways, telegraphs, postal and police departments. In 1881, the British returned the city to the Wodeyars. Diwans like Mirza Ismail, and sir Vishweshwarayya were the pioneers to help Bangalore attain its modern outlook. 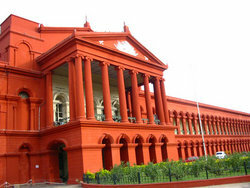 With the direct rule of the British Commissioners based in Bangalore, it became the State Administrative HQ. The destiny of Bangalore thus took a historic turn, making it eventually a major city of India and one of the fastest growing in the world. After independence, Bangalore's choice as a state capital was only logical. Mysore had too many associations with the royal family to be the capital of a new state with an elected Chief Minister and a nominated Governor. Finally, for an enlarged Karnataka, Bangalore was more central and better linked with the major cities of the country. Today, Bangalore is booming, and a look at some of its nicknames says why: "India's Silicon Valley," "Fashion Capital of India," "The Pub City of India," and on. Home to well over 6 million people, and a base for 10,000 industries, Bangalore is India's fifth largest city and the fastest growing city in Asia. BC (-) Stone Age implements, Roman coins & burial grounds unearthed. 1690 Sells it to the Wodeyars for 3 lakhs!